I have lost 4st56lbs25.4kg since 5th November 2016. I had actually lost 1st 13lbs27lbs12.2kg before joining Nutracheck but was starting to lose focus and motivation. The Nutracheck site helped me to refocus, stay motivated and ultimately lose a further 2st 1lbs29lbs13.1kg. Although I had never considered my weight to be a problem per se, I always knew that I could afford to lose a little but never really gave it serious consideration. Then I was confronted with the brutal honesty of the mirror and the camera. This was coupled with the deaths (in very close succession) of an elder brother, younger sister and very dear friend that made me think (a.) about my mortality and (b.) question my current lifestyle. There is absolutely no point in being active and thinking that everything is just fine, if in between you are treating yourself like a dustbin. So, I finally decided to do something about it. How did you hear about Nutracheck? Has your weight stayed fairly consistent over the years, or have you always had to manage it? I used the calorie counter via the NHS site. Having always led a relatively active lifestyle (at least up until I turned 60) my weight had never really been of concern. It has been during the last 2 or 3 years really that I had become conscious of the ever-increasing waistline. Anyone can lose weight with a little bit of effort. The secret is however, not to find it again. It has at times been hard work - requiring a degree of self-discipline, commitment and occasionally a bit of selfishness but it would also be true to say that it has not been difficult. Particularly as I have always felt comfortable with the rate of my weight loss and am enjoying the experience. Actually getting started and accepting it would be a fairly long-term project. Once in the routine however it became enjoyable. Apart from the obvious health benefits - proud of my achievement and looking ahead, because I am never going back. 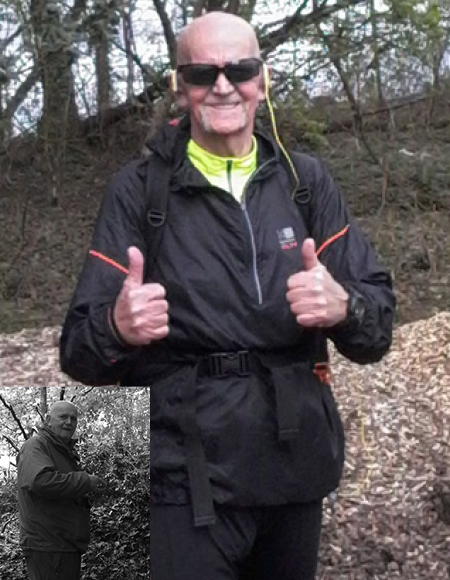 Apart from it being 43 years since I last saw this waistline of 34" and weight of 11st154lbs69.9kg, I am now preparing myself for a 160 mile solo trek through the Sottish Highlands. This will mean some additional strength training and addition of weight but I now have the room for an extra 7lbs7lbs3.1kg of muscle as opposed to fat. What tips and advice can you give to anyone who has weight to lose? Anyone can lose weight with a little bit of effort - the secret is however, not to find it again. This is best done by looking at it as a 'lifestyle change' rather than a diet. The following helped me tremendously. If you have 100lbs to lose then set your first goal at 10lbs. Once this first goal is achieved, it is surprising how manageable further goals will become. Every little success builds your confidence and self esteem. Seldom do things go exactly as planned and it is all too easy to allow the distractions of life and the unexpected to create obstacles. Forever crossing the dreaded plateau, or the sudden weight gain and the old 'goblin on your shoulder' questioning whether or not it is worth the effort. Achieving weight loss is a bit like crossing a river on stepping stones. Your goal is the far bank but you know that it can't be reached with one huge leap, it will take lots of small careful steps to get there. Occasionally you will slip a little and get your feet wet - don't worry! The idea is to regain your footing and avoid falling in. It's okay to take the occasional glimpse of the far bank to see how close it is getting, but keep your focus and your concentration firmly on the stepping stones. You must have this in abundance, otherwise 'the failure goblin' will be forever poised on your shoulder whispering excuses into your ear. Decide on three key reasons why you want to do this and keep them securely locked in your head for those times when you can't be bothered. Occasionally one or possibly two of those reasons may temporarily lose significance but never all three, so you will always have a reason to get it done. Nutracheck resources are a brilliant set of tools, a superb set of tools, an educational set of tools, a stunningly supportive set of tools. But just tools none the less and like all tools, efficiency and quality of results depends greatly on the user. Nutracheck is highly effective if used properly. It won't do it for you but it will give massive support. So the next time the 'goblin gang' are dragging you under, draining your motivation and telling you to 'go ahead and eat it anyway' - reach for the goblin repellent and give the pests a liberal coating. You will find the repellent in the box marked determination. If you really want it - you can really get it!!! The most fragile yet one of the most important pre-requisites can be easily battered by a multitude of blunt instruments such as narrowly missing a target, hitting the plateau, unexpected weight gain, negative comments, unsupportive partners, friends and relations who can also be downright obstructive (if in a subtle manner). This is where we rely on our core strength (and I don't mean abs) our desire to succeed and our 'key reasons'. It pays to remember that on this journey at least, you are the most important person and sometimes it is okay to be selfish. We all draw our strength from a variety of sources, whether we believe that to be from our gods, our friends, our families, our cultures, online communities and more. There is however only one place we can draw our self belief from and that is from deep within each of us. The depth may vary between individuals but the belief is there to be found. You simply have to dig deep enough!